Dallas Forth Worth has become one of the fastest growing areas in America. It accommodates thousands of weddings every year. Furthermore, some of the most elegant hotel wedding venues reside here. We began working on this blog series to help connect couples with their dream venues. Our list of Top 22 Dallas Fort Worth Indian Wedding Venues benefits each couple that wants an amazing wedding weekend. When coming up with this list we thought about events that are part of many Indian Weddings (Hindu, Muslim, Christian and Sikh). Pre-wedding celebrations such as the Garba, Sangeet, and Mehndi nights can be held in the smaller ballrooms, there is a clear path for baraats, and the larger ballrooms are spacious enough for the traditional big fat Indian wedding. 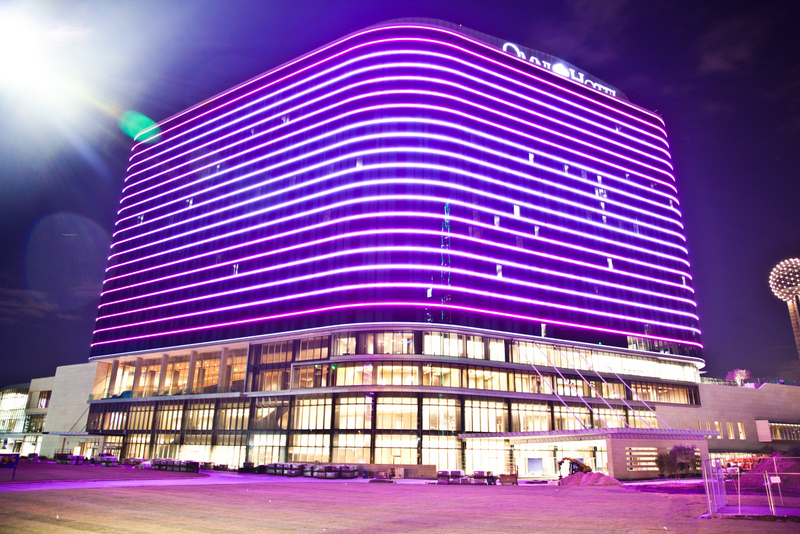 This venue lights up the Dallas Skyline with its amazing LED lighting around the building. Couples that want top tier weddings can use one of the two spacious ballrooms the Omni has to offer. This is one of the most popular on the list of Top 22 Dallas Fort Worth Indian Wedding Venues . Here is a recent same day edit from a wedding we did at the Omni for Rohan & Rishika (September 2017). South Indian Groom and Punjabi Bride. They had their Sangeet, Baraat, Wedding and Reception at the venue. The festivities begin with the Sangeet in the Dallas ballroom, then the baraat takes over the streets of Downtown Dallas, followed by the wedding and reception both in the Trinity Ballroom. The video shows all of those events except the reception. Each ballroom at the previously named Intercontinental Dallas now Renaissance Addison has its own feel and atmosphere. The layout of all the ballrooms has a very individualistic design and you can see how the structures are made out to perfection. This is one of the second most popular on the Top 22 Dallas Fort Worth Indian Wedding Venues. Most of the large reception take place in Crystal Ballroom. Small receptions usually opt for Malachite ballroom. Garden Court is perfect for wedding ceremonies. It gives you that outdoor feel while playing it safe with Texas unpredictable weather. Check out how great Tilu & Eric's reception was inside the Crystal ballroom at the Renaissance Addison. This fun Malayalam couple wanted us to keep the dance floor full all night. The lights, music and energy all made it possible. The Renaissance Dallas had its additional ballrooms recently built. The grand ballrooms of the Renaissance have a modern touch to them with solid, dark details along the room and high ceilings. In addition, the terrace has a beautiful outdoor wedding ceremony or cocktail area with an admirable view of the Dallas skyline. This makes it one of the most unique Dallas Indian Wedding Venues. Here are the highlights from Suzette and Anik's wedding weekend at the Renaissance Dallas hotel. We love mixed couples and involving all of their guests in the celebrations which is what the bride and groom love about us. It is important to not only balance out both cultures but also do everything you and your guests will enjoy. Their elegant ballrooms have ample room for the cocktail hour area therefore guests can mingle freely. The ballrooms have great accents and mirrors on the walls for a royal wedding feel. We have Dj'd there many times, most recently on September 15th, 2017. The Hilton Anatole stays busy all year round as a result of taking care of their couples. A few years ago we had done baraat's during all four seasons. The winter baraat is the best one where the grooms' side danced their hearts out to stay warm. Its one of the more classy and popular Dallas Indian Wedding Venues. Thanksgiving Weekend 2017, we will be back there again, and update the blog after that with video of our setup. Until then, enjoy this wedding which we were not a part of. The luxurious ballrooms at the Ritz makes you feel as if you are royalty. As a matter of fact, this is one of the most luxurist Dallas Indian Wedding Venues. It is the perfect place for a king and queen to host their wedding. This ballroom in particular looks great with two tone uplights which most DJs and Lighting companies don't have (don't worry, we have them). Checkout the highlights from Cerin & Jibi's reception as an illustration to have a grand ball. They are a young Malayali couple that love an elegant reception and then hosting an afterparty with their closest friends. This couple hired us because they wanted to keep the mood classy and fun. This hotel is attached to the Galleria Dallas. With its’ elaborate ballrooms you will leave your guests mesmerized. The area provided with each room makes sure there is plenty of space for an epic dance floor. The biggest ballroom is Dallas, followed by Fort Worth. There is a space, San Antonio, next to the pool thats indoor but has large windows which is great for ceremonies. If you have a lot of out of town guests, this Dallas Fort Worth Indian Wedding Venues a great place to keep them entertained with the mall when they aren't busy with wedding weekend events. Check out Omar and Zaneb's valima in the Dallas Ballroom. When the groom pulls up in a Lamborghini, the rest of the night has to be classy and fun. The newly renovated hotel has ballrooms that provide a flexible space with beautiful high ceilings. Elevate is located on the 20th floor. Nice open feeling with a view. Great for a sangeet night. Most wedding and receptions take place in the Grand Ballroom. We added this hotel into the Top 22 Dallas Fort Worth Indian Wedding Venues list because its near Addison and popular for Indian weddings. Here are the highlights from Stephie and Tony's reception at the Westin Park Central. We love how our Malayalam couples party all night long. It is important to not only balance out all the cultural aspects of the reception but also do everything you and your guests will enjoy. A palace style wedding awaits you here at the Worthington Renaissance. Imagine taking over the streets of Downtown Fort Worth for an epic baraat coupled with the Terrace; a great setting for an outdoor wedding with its rooftop feel and views. They have smaller rooms for the sangeet night while the Grand Ballroom is perfect for receptions. This is one of the most unique on the list of Top 22 Dallas Fort Worth Indian Wedding Venues. Here are the highlights from Saloni & Mirza's wedding weekend at the Worthington Renaissance. We love mixed couples and involving all of their guests in the celebrations which is what the bride and groom love about us. It is important to not only balance out both cultures but also do everything you and your guests will enjoy. Welcome to the ideal place to host your wedding weekend. This Dallas Fort Worth Indian Wedding Venues has grand ballrooms, lovely gardens, and Lake Carolyn you will feel the vibe of what your idealistic wedding can be. Here are the highlights from Elizabeth and Sunil's weekend Reception at the Omni Mandalay Las Colinas. We love mixed couples and involving all of their guests in the celebrations which is what the bride and groom love about us. It is important to not only balance out both cultures but also do everything you and your guests will enjoy. With many ballrooms here at the Four Seasons you will find the perfect space for your wedding. The purity of the rooms will give you the ability to add in your own chic styles for an antique or modern feel in the reason it made it to our list of Top 22 Dallas Fort Worth Indian Wedding Venues . We have done many events there but wanted to share a wedding with you that we weren't a part of. Natasha & Sandeep utilized the space very well. Sang night at the Pavilion, outdoor Baraat and Wedding and the reception in the Four Season Ballroom. This hotel is located in a superb area. Nothing says wedding like the Shops at Legacy. From a great lakeview, amazing tourist attractions, authentic food, and nightlife; your wedding will be the talk of the town. This venue has a lot of experience with Indian weddings, as a result this is how it made it to the the Top 22 Dallas Fort Worth Indian Wedding Venues list. Although we have lots of weddings that happen at this Marroitt and the staff loves us there, we wanted to share a wedding we didn't do. Steven and Reena's video does a great job of showing you the area outside the hotel and the ballroom. Plano is on pace for rapid growth. The new Legacy West area is a big attraction landing in Plano in extension to the Shops at Legacy. The Renaissance will find it’s home at Legacy West, therefore it will be a centerpiece in an amazing area. A brand new venue for a wedding that can be the perfect place for you. Out of the Top 22 Dallas Fort Worth Indian Wedding Venues list, this is one of the newest ones. We love being the first Indian Wedding DJ's at new venues. We will be there for the first Indian Wedding in November 2017. Check out Hari and Ekta's wedding we had a chance to be a part of! This is a very new and modern style hotel. When people are looking for that modern and chic style; look no further, The Hilton at Granite Park is the paradise you have been searching for. Out of the Top 22 Dallas Fort Worth Indian Wedding Venues list, this is the only one that has an in-house Indian Chef not to mention who can make great food. The last two times we were there were for an open house and a Bollywood themed corporate event. The next time we will be there is February 2018 and will share the wedding video afterwards. This is a brand new venue that is now open in the heart of Frisco and is one of the newest hotel in the Top 22 Dallas Fort Worth Indian Wedding Venues list. It hovers over the biggest attraction in the North Dallas area; The Star! The Omni is a high rise hotel not only offering a great view but also an enormous amount of space for a grand wedding weekend. They invited our team to take a tour of the facility so we can see how its been designed and we can play out how to make weddings great there. The first Indian wedding will take place in March 2018. Since we are on board for that wedding, we will share a video from the wedding shortly afterwards, until then enjoy this animation. Embassy Suites Frisco is attached to the Frisco Convention Center which is where the weddings are held. This enormous space can not only accommodate the close-small intimate affairs but also the marvelous huge celebrations. Come into town a little early or stay later, you’ll enjoy all the activities this hotel has to offer. The amazing ballroom has a dazzling stage which makes you visible to all your guests all the way from the space in the back. This ballroom in particular looks great with two tone uplights which most DJs and Lighting companies don't have (don't worry, we have them). Amongst the list of Top 22 Dallas Fort Worth Indian Wedding Venues, this is by far the largest. Checkout the highlights from Cerin & Jibi's reception as an illustration to have a grand ball. They are a young Malayali couple that love an elegant reception and then hosting an afterparty with their closest friends. This couple hired us because they wanted to keep the mood classy and fun. Bright fluorescent chandeliers surround the ballroom here at the Courtyard. Let this ballroom be the start to a perfect wedding weekend. We loved being a part of Pavan & Akisha's wedding because they used the entire hotel so well. Photo shoots and ceremonies were held inside the ballroom and outside by the pool, Garba and the reception were held in the main ballroom. Couples wonder why we are perfect Wedding DJ & Lighting company. Along with hundreds of Indian Weddings every year, we also perform at quite a few Country, African American, Hispanic and Asian Weddings. Since we do many different culture weddings we are the best choice when wanting to keep your family and friends happy and on the dance floor. There are two beautiful ceremony spots where you can complete your vows to that special someone. This was a very popular venue in the past but not many took place here until recently. They just finished renovation and thats how it made it to the Top 22 Dallas Fort Worth Indian Wedding Venues list. In October, we did two weddings here and both of them were great. Sarita & Souvik wanted to be unique when it came to their wedding. The groom rode into the hotel on a horse. Their first dance looked like a bollywood movie with the decor in the background, our dreamy first dance on a cloud effect and the fresh rose petal canon was perfect. We love helping couples that want to make the wedding unique. From an outdoor wedding ceremony, to a spacious cocktail area, and to top it off with a beautiful ballroom; The Hilton Garden Inn is the best location to have your wedding. It made the list of Top 22 Dallas Fort Worth Indian Wedding Venues since they have hosted many of the Indian Weddings here. Take a look at how much fun Jason and Lisa's reception was at this venue! Enjoy the all new Sheraton McKinney with a southern style modern feel. The beauty of this hotel is that you can enjoy the romantic and picturesque view with your special someone. The Hilton Garden Inn is the best location to have your wedding. Check out how we turned up the energy for Jazib & Nidah's wedding with great lighting and amazing music. The ballroom of the Union Station has amazing natural light that makes the inner designs stand out magnificently. This is definitely a space you can utilize to make your royal wedding come to life. Nina & Alex are a mixed couple and they really love the fact that more than half of our weddings are mixed weddings. Check out the lights and the packed dance floor all night. Host your celebrity style wedding here and enjoy the view the cocktail area brings. The ballroom is enormous and can fit all your dream wedding ideas you would love to incorporate. This is one of the largest structures on the Top 22 Dallas Fort Worth Indian Wedding Venues list. Jennifer & Bino wanted great lighting and the perfect music to keep their friends and family on the dance floor all night. The Top 22 Dallas Fort Worth Indian Wedding Venues list are filled with perfect options for your wedding. Enjoy your special day in style and a weekend unmatched like any other. Your wedding is the happiest moment in your life therefore choose a venue you love and the right vendors that will help make your special moment a time you’ll never forget. Over our 23 years of bringing joy to thousands of couples, the DJ Riz Entertainment team performed many times at all of these Dallas Indian Wedding Venues and can ensure you will have the time of your lives. Given these points, if you would like to talk about which venue we think is best for you or want more information on our services, contact us here.